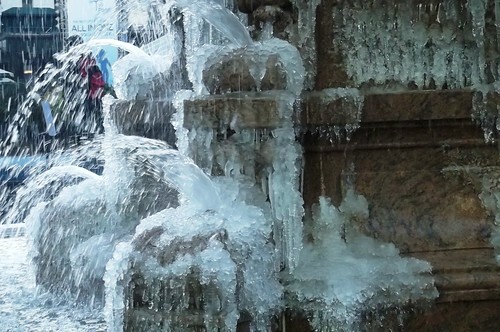 If last week was cold, today, New York is freezing! 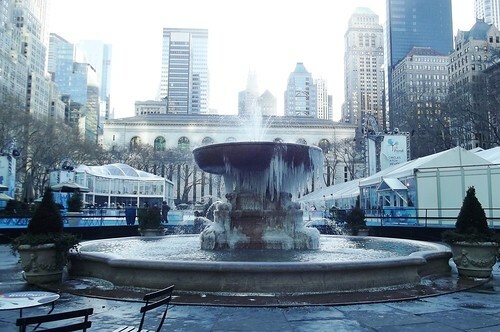 I am almost sure my favorite fountain in Bryant Park will be heavy with ice. Just when I thought this year would be warmer and easier. The morning began with single digits today and it didn’t really go up by much. Blogging consistently. While it seems like I’ve been a Monday and Friday blogger, I think that is quite a feat considering I haven’t been writing this much for the longest time. It takes a conscious effort to begin a post — but writing has never really been an issue to me. So it’s more about making time. I am trying and happy to be at this pace, yet hoping to write more in the coming weeks. Destash ongoing. This should really be in my next Friday Five but it’s a Monday and it’s work in progress. And my weekend is still technically on because we have a long weekend this time around. (It’s Martin Luther King Day so I got Monday off.). I started going over my magazine pile for destashing. The first one was a Food & Wine magazine from 2003. Older than my little guy! Now, I’m one for keeping food magazines for the recipes, and right now I just can’t part with this. So of the three I’ve gone through so far, only 1 is heading out the door. I should do better than this, I know. I am trying!!! (Does it help that I’m planning to do a second pass when the pile has dwindled?..). There is more that I need to get rid of and I have vowed to do this in earnest. The goal is to go through at least a dozen this weekend, and I’m a quarter of the way through. Fabric haul. From time to time, I browse Craig’s list for free fabric and craft supplies listings. I will write about this another day, but I got lucky when I hit it Friday evening and saw a giveaway in Brooklyn. I emailed and got an address for a storage place. After trying to figure out the best way to get there, I settled on uber pool and packed my expanding luggage and shopping totes. Saturday, I thought getting there at 2:55 for a 2-5:30pm slot would be plenty of time, but I arrived just as the entire haul was almost totally gone! 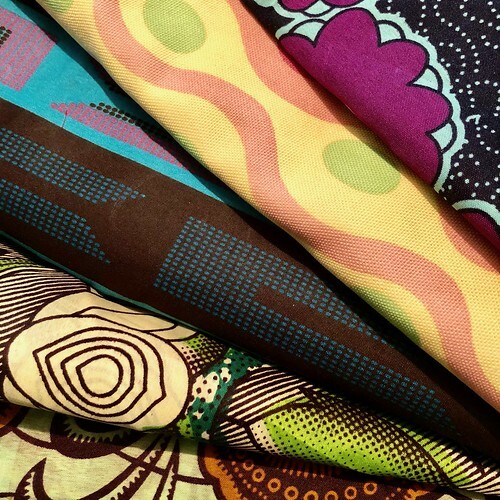 Still, I managed to grab some nice African prints and other fabric and yarn. There were also several patterns, some uncut and complete with instructions — in total making up for the cost of the trip back and forth. I figured it was more or less the cost of a trip to Michael’s and I think I got that much and more. I am craft happy! Taking time to go to my quiet space. It seems that I am needing to reflect more and more these days, with so many things happening around me, and not happening at the same time. I know it is a time for prayer — and a time for reflection. Someone told me I’m stressing too much about so many things that I should be easier on myself. Today, I tried. Winter Restaurant Week in NYC. Yes, it’s this week!! I will write about this more next time but this is the Branzino I had at Ortzi by Jose Garces at the Luma Hotel NYC. Definitely recommending you try this! It’s called LUBINA on their Restaurant Week menu ($26.00++) for a two course meal. 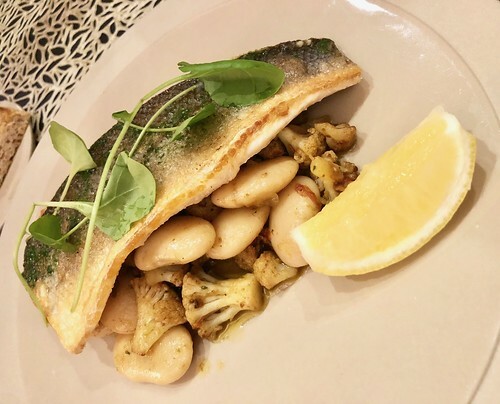 It’s Branzino with Gigante Bean Stew, Spiced cauliflower, Hazenut sofrito and Pequillo peppers. Am I glad I braved the cold and went to the city and had a relaxing and filling lunch. Nothing beats good food and good company. That’s another post altogether. Here’s to a good and not so cold week ahead for all of us here on this side of the world. And a good one for the rest of you! It’s another Friday — and a super cold Friday at that. 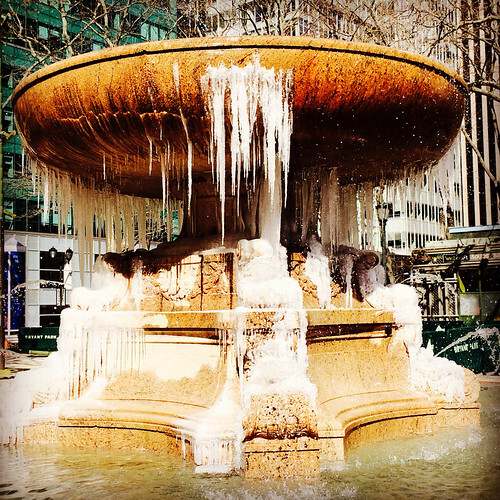 I took this snapshot of my favorite fountain here in Bryant Park this noon on the way to pick up lunch and a few odds and ends for a weekend project at the bead stores. 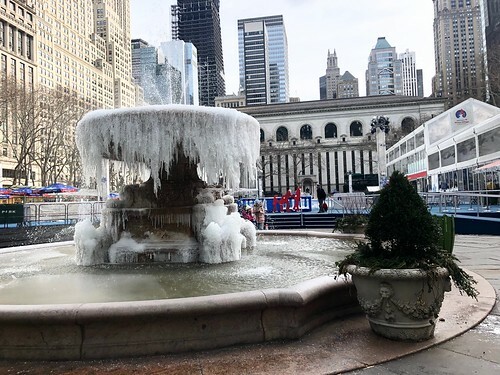 As you can see, the Josephine Shaw Lowell Memorial Fountain is freezing up again and will likely be another elegant ice sculpture over the weekend, more so when we get some snow again from Sunday into Monday. I can never tire of taking pictures of this gorgeous fountain. It’s not one of our more majestic ones but it has it’s own reason to be proud as a source of beauty in this great city. I haven’t quite moved as progressively as I had wanted in the fronts I had hoped to work on. I wish I could… but sometimes, you just get paralyzed from all the movement and find yourself moving and not moving at the same time. There are the projects and homework to finish. He takes precedence, of course. At the end of the day, I had wished I could just finish dinner and curl up in bed and lay down to sleep. But there have been many late nights and no reprieve from being the first to wake up the next day. Tomorrow, I will get my chance — I hope. Even just an extra hour would do wonders. I wish I could just sit in the park and watch the world go by but it is too cold to do that. There are many thoughts crowding my head that at times, something as trivial as playing slot machine games (just for play, not for money) on my iPhone helps to bring me down to a quiet calm. I haven’t written much. None of the letters I had hoped to write have been written. Rereading those two sentences made me sigh deeply at the thought that my world seems to be stuck at a certain point even if I know I’m moving in all directions. Sometimes we get so busy that we end up seemingly standing still even if we aren’t. 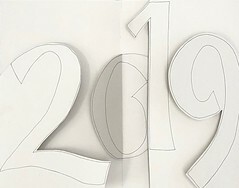 And although it’s another winter weekend — I hope to do a few things and hopefully report back with something accomplished. 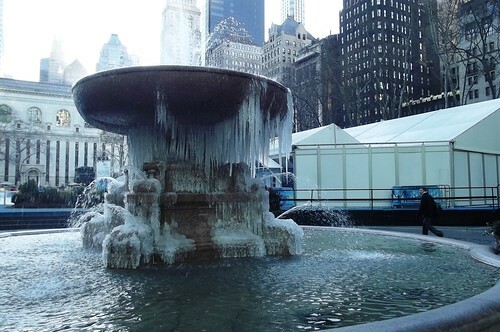 Yes, it’s freezing cold in New York today. 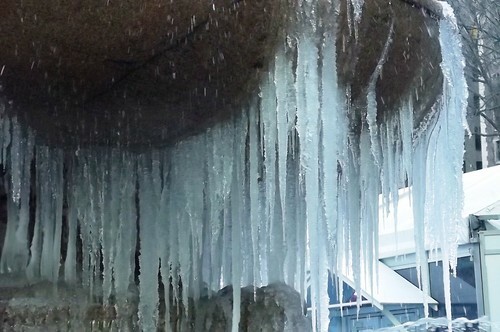 These pictures will tell you just how cold it is. I made it a point to look out towards the fountain when my bus pulled over to drop me off at my stop and I grabbed my camera and snapped away despite the cold before I went into my building. I can only imagine how much worse it’s gotten since. Days like this make me yearn for the warmth of Manila… even at its worst, the storms somehow seem more bearable than the onslaught of winter.